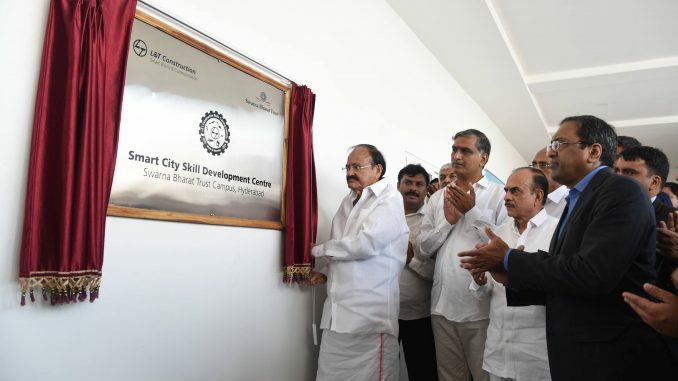 New Delhi: The Vice President of India, Shri M. Venkaiah Naidu has said that the Healthcare sector and Skill Development in youth crucial for India’s progress. He was addressing the gathering after inaugurating a Medical Camp in association with Star and Rainbow Hospitals and two Skill Development facilities – CCTV Network Management and Optic Fiber Technician courses in association with L&T Smart World Communications Limited and GATI Drivers Training Institute in association with Gati-KWE Pvt. Ltd., at Swarna Bharat Trust, in Hyderabad today. The Deputy Chief Minister of Telangana, Shri Mohammad Mahmood Ali, the Minister for Irrigation, Marketing & Legislative Affairs, Telangana, Shri T. Harish Rao, the Minister for Health and Medical Education, Andhra Pradesh, Shri Kamineni Srinivas and other dignitaries were present on the occasion. The Vice President said that the governments expenditure not remaining commensurate with growing demands in the healthcare, the private sector has come to play a dominant role in both urban and rural areas. He further said that in urban areas, only 32 per cent of the patients visit public hospitals with the rest 68 per cent preferring private hospitals. In rural areas, 42 per cent patients visit public hospitals and the rest visit private ones, he added. The Vice President said that there is a definite need not only to expand the infrastructure in public health sector, but also increase the budget. He further said that the number of physicians available per 10,000 people, their number is grossly inadequate in India when compared to developed countries. While the number of physicians available is 20 per 10,000 people in developed countries, it is only six in India and the country needs 10.5 lakh doctors while we have only 6.5 lakh, he added. The Vice President said that to reach WHO norm of one doctor per 1,000, (there is one doctor per 1700 population in India) a high-level committee of NITI Aayog has recommended the setting up of 187 more medical colleges by 2022. Similarly, the number of hospital beds per 10,000 is 40 in developed countries while it is nine in India, he added. The Vice President said that India is the youngest country with 65% of our population below 35 years of age. He further said that India must skill its young population not only for economic benefit but for social reasons too. Indias huge human capital has to be made more qualitative with focus on rapid growth of productive enterprises and jobs and growth and inclusion must go together, he added. The Vice President said that specially designed training in tune with the market needs should become part of the educational system so that students who pass out find immediate employment and are not left out in the lurch. He further said that manufacturing currently contributes about 13% to the GDP of the country and Make In India seeks to increase it to 25 per cent in the coming years to give a major push to the economy. In China, the manufacturing sector contributes about 36 per cent to the GDP, he added. The share of manufacturing in the GDP at 13% is amongst the lowest as compared to many rapidly developing economies, he said. The Vice President said that the sector as a whole has been facing shortage of skilled manpower and the efforts of the government in skilling the youth should be supplemented by the corporate sector and the industries so that the target of 25 per cent contribution to the GDP is achieved faster. He further said that this is the time when Skill India, Digital India and Make in India can work in conjunction in one ecosystem and create a new resurgent India. We have to ensure that we scale up our efforts with greater speed and with proper ecosystem, India will become the worlds largest exporter of skilled manpower in the future, he added.